It’s time for another installment of what I call The Real Fundamentals for playing the game of golf well. This one is especially important to me, because I don’t think I’m going to be introducing anything new to the game (just like in part 1), but just how I like to think about this concept we have heard about a lot. Easily the number one request I get when I meet a new golfer is “I just want to hit the ball straight.” While that is an admiral goal, and one that if you could do, I’m sure it would help you lower your scores, but usually I know right away, there is a misunderstanding of how to control the golf ball. Why I start to get concerned when I hear the word straight is because we associate the word straight with a swing that swings straight down the target line. 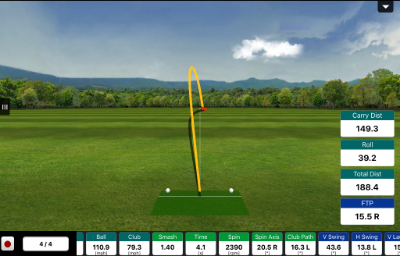 The player then tries to drag the club straight back and have the club swing on a straight line through the ball. What players don’t realize, is there is a 3D component to the overall direction of the swing, so when you take this straight line approach, you are actually going to be cutting across the ball and producing the side spin that causes the dreaded slice. The thing I want you to start understanding as a golfer, is that you control the golf ball. Yes, you control the ball, just like if you were to make a throw in baseball or shoot in basketball, you control the motion. In those sports I just mentioned, if you make a bad throw or miss a basket, we typically don’t look at our mechanics as a reason as to why we missed a shot, we usually just accept that it happens. In golf, for some reason we start breaking down the mechanics so quickly even after one bad shot. However, we must remember this is a sport, and our goal is to try and manage some variables as best we can. The variables we are talking about today are club path and club face control. So again, the idea, is you control the golf ball. To do that, you must control the club path and club face of the club. Most of us have heard that we need to “hit the ball from the inside” or swing out to right field (for righty players), or some sort of advice to this degree. But when I talk to many players, they will actually have a swing that is “on plane” or “swinging out” and they still slice the ball. That tells me immediately that we don’t understand why we are swinging “on plane” (and I’d be up to argue about if swings can really be or should be on plane). Our goal as the golfer is to control the side spin of the golf ball to be able to control the direction. To do this we need to start understanding that the club face and club path work together to do so. When I refer to the club face, I am referring to the angle the club face is pointing the moment it strikes the ball at impact. The club face can either be pointed to the right, left or be zeroed out which means pointing straight. The club path, is the horizontal angle that the club is traveling into the ball relative to the target line (straight line that travels through the ball straight to the target). I’m going to show you some Flightscope images and data to help you start to see how both of these items, club face and club path work to help us control the golf ball. This picture shows what I see from a typical golfer who struggles with a slice. If you pay attention to the bottom right box that is labeled “FTP,” that box represents the relationship of the club face relative to the path of the club. As you can see, the club face is pointed 15.5 degrees to the right of the path of the club. This means this player swung the club way to the left and held the face open. This player wants to draw the ball, and will never be able to with a path to face relationship like this. This player also spent a lot of time working on the mechanics of his swing to produce a draw, but the mechanics never worked because his brain didn’t understand how to hit a draw. The club face and club path mechanics his brain thought were needed don’t match up with how a draw is actually hit. Now we look at a different type of club path and club face relationship. This one produces a draw. Again if we look at the bottom of right of the screen, we will see our “FTP” box, and this one says 4.2LThis means the club face is pointed 4.2 degrees left of the club path at impact. This type of relationship puts a left ward spin (for a righty) on the ball which produces a draw. Again, the club face is now closed to the club path, which produces the draw spin. It is very important that you start to understand these relationships, because what I see is good players let the knowledge of these relationships, shape their swings. Everything we watch and read tell us what good players do in their swings mechanics to be able to hit powerful and straight shots, but I believe that is backwards thinking. These players have such an uncanny understanding of how to control the ball, that their swings begin to shape where we see a lot of the similarities in their swings we are used to seeing. So how do you practice this? My favorite drill to do with students, is go out and purposeful spin the golf ball. Make a swing and purposefully swing the club left with the face pointing way to the right and watch the ball spin and slice to the right. Then try to go to the opposite side, and swing one with a path way to the right and the face hammered shut to the left. You might see the ball be very low and smother hook into the ground. That’s ok to see bad shots, because then after you hit a few of each, start working more towards the middle in each direction until you decide to hit a certain shape at a target. You’ll be amazed at your ability to control the ball. Also if you can, tape your swing before and after. I think you’d be amazed at the look of the swing and how a lot of the fundamentals you want are there. Real Fundamental #2 is a little more complicated than #1, but again I see so many students who have so much information about other parts of the game, but don’t understand this, and they never score or produce the shots they want. Instead of working on mechanics to produce a shot. Start working on your understanding of producing a shot to develop your mechanics and see how that works as a starting point for your swing and game. I’ve seen many people drop as many as 60 shots in less than 10 weeks doing this, and I bet you could drop some shots too. Good luck and play well. Cheers!